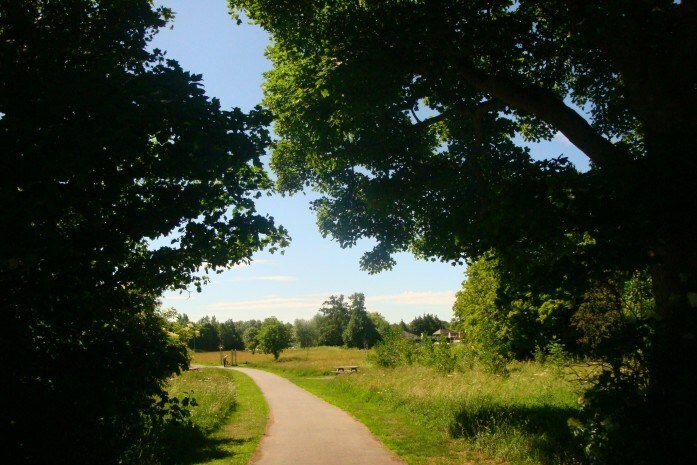 Countess of Chester Country Park brings the countryside closer to the city, providing visitors with the opportunity to enjoy natural and peaceful surroundings as they wander around the park’s pathways. A path leading into the sun from beneath the tree canopy at The Land Trust’s site The Countess of Chester Country Park. The Land Trust, who owns the site, is working in partnership with The Conservation Volunteers (TCV) to manage the Countess of Chester Country Park for local communities. We will take a long term approach to management, building the benefits over time. The park hosts a varied programme of events which includes activities that improve people’s health, deliver education and training as well providing opportunities for volunteering. Down at the wetland you may spot a Kingfisher spectacularly dart into the water or a grey Heron patiently waiting at the water’s edge. Kestrels hover majestically over the grasslands, which in summer attract colourful butterflies such as the Common Blue, Peacock and Red Admiral. Whilst in the woodland you may see a Greater Spotted Woodpecker or a Sparrowhawk. Chester parkrun takes place every Saturday at 9am. It is a 5 km challenge – you against the clock – and is free and open to all, whatever your age and whether you want to run, jog or walk. More than 1,000 different people have completed Chester parkrun since it started in July 2016. The event is entirely organised by volunteers – around 16 people help out each week – so you can still get involved even if running isn’t your thing. Visit the Chester parkrun page for more information. All participants should register online (which is free) and bring a printed copy of their unique identification barcode each time they attend. There are regular Health Walks at the park – visit the Events page for details of what’s coming up or scroll to the bottom of this page to download more information on activities. The Chester Memorial Forest was opened in July 2015 by the late Duke of Westminster. The aim of the memorial woodland is to help enhance the biodiversity of the park so that eventually it will become a popular woodland walk surrounded by pastoral meadows. The Life for a Life scheme allows people to plant trees, such as English oak, Silver birch, Mountain ash and Wild cherry, in memory of loved ones, helping to create a beautiful forest that everyone can enjoy. Find out more at Life for a Life Chester Memorial Forest. 5 totem poles in the park to find, dipping platform and boardwalk, measured distance route, Fallen for the Fallen poppy route. 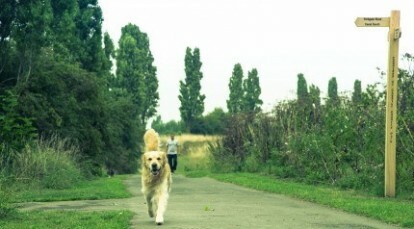 The Greenway (cycle and footpath) are approximately 10 minutes away, providing a green link to other areas. It is also adjacent to the canal and links to lots of local footpaths. Much of the new park is located on a former landfill site that was next to the Countess of Chester Hospital. This closed in the 1970s when it was made safe, capped with soil and grassed over. Thirty years later the Homes and Communities Agency (HCA) took ownership of the site, allocated some of the land for housing development and gave 19-hectares to the Land Trust to develop a country park. The park is located in Upton, Chester, between the Countess of Chester Hospital and Parkgate Road. The land is within the Chester greenbelt and borders on the Shropshire Union Canal. The Homes and Communities Agency provided the Land Trust with funding which will effectively secure the long term future of the park. This funding will ensure this park can be managed for community benefit which will have a direct effect on the lives of thousands of local people, creating positive outcomes for health, social, cohesion, education, environment and the local economy. The Trust will work with other adjoining landowners including the NHS Trusts, to secure the future of the open space as a community health and well-being park. To create the park, a series of pathways and trails for walkers and cyclists were constructed, connecting to local footpaths and the canal towpath. Hedge laying and localised tree planting have helped to enhance and conserve the site’s ecological interest, open views and existing features. Work has been undertaken by the Environment Agency to create a reed bed, while drainage improvements have been carried out at Finchetts Gutter. 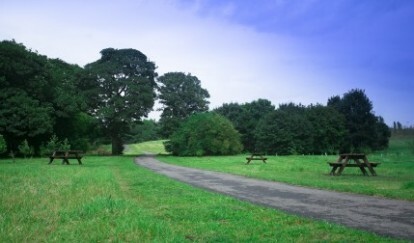 The park has also been registered as a NHS Forest site and a Jubilee Wood, as part of the Queen’s Diamond Jubilee celebrations. Countess of Chester Country Park has been recognised with a prestigious Green Flag award. The site in Upton in Chester joins Silverdale Country Park in Newcastle under Lyme, Elba Park in Sunderland, Beam Parklands in Dagenham and Greenwich Ecology Park in London on the list of Land Trust sites recognised by Green Flag. Countess of Chester Country Park was shortlisted in the Cross-sector Partnership of the Year category at the Charity Times Awards. Countess of Chester Country Park won the Best Community Health Initiative category at the Horticulture Week Custodian Awards. Cheshire and Wirral Partnership NHS Foundation Trust in partnership with the Land Trust have been shortlisted in the category of Improving Patient and Community Engagement at the Healthcare Transformation Awards. The Chartered Institute of Ecology and Environmental Management (CIEEM) is the leading professional membership body representing and supporting ecologists and environmental managers. Its award scheme is all about recognising positive environmental and conservation impacts across the country. The Countess of Chester County Park was honoured with a Highly Commended NGO (Non-governmental organisation) Impact prize at the recent Chartered Institute of Ecology and Environmental Management (CIEEM). Since being opened to the public by the Duchess of Cornwall last September, the Upton-based site, next to the Countess of Chester Hospital, has already proved popular with residents, visitors, staff members and users of the hospitals. The Countess of Chester Country Park was honoured with a Chester Civic Trust award for benefiting the built environment. The Chester Civic Trust selected the public park as a benefactor of the Civic Trust’s awards scheme recognising changes to the built environment during the past 12 months. Health chiefs dig in to show their support!